When the proper event planning has taken place, improving attendee engagement at your next corporate meeting is a guarantee. During the preparation phase, consider each element involved and decide how they’re going to impact the participant (notice we didn’t say attendee) experience. How can you ensure the attendees will walk away as participants? Will the decisions you’re making create meaning for participants during the event? Are the choices you’re considering effective in connecting your people? Ask yourself these crucial questions as you design the event to ensure that every option is planned with purpose. When it comes to choosing the event space, keynote speakers and entertainment, narrow your choices down to those that are relevant to the event’s objectives and audience’s needs. Be mindful of the accommodations that need to be made. Each decision should respect what your company values, be it ethics, transparency, innovation or others. 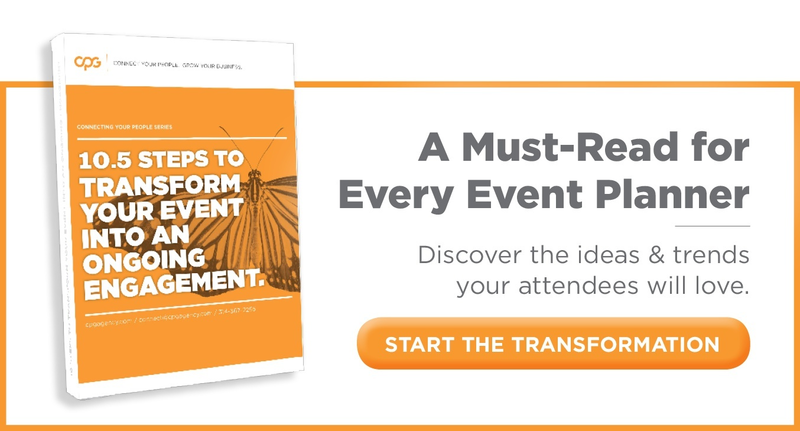 Favor purposeful options that allow participants to get the most out of the event experience. During your search for a fitting venue, the sky’s the limit. That’s not to say that the event budget doesn’t dictate your final decision, but in the beginning stages, explore all of your options. Site visits paint a picture of possibilities for the event. It’s where the ideation really begins. CPG Account Director, Michael Taylor is a site visit specialist. According to him, a site visit is the equivalent of a blank canvas; it’s when you truly find out what can be accomplished within the space. Even if the budget for your corporate event is not as flexible as you’d like, different venues offer a variety of opportunities to push the envelope and make accommodations. For example, depending on the event’s size and scale, venues may offer outdoor or private spaces for team building or break-off sessions. These micro-experiences enhance interpersonal relationships for your people which further encourage engagement. In the end, the deciding factor for a venue is one that will contribute to important accommodations and meaningful interactions. For instance, Carnival Corporation’s annual event, in particular, draws a global audience. The venue and destination chosen were based on what was simple, like reliable WiFi, yet progressive, like networking spaces, for such a large group with individual needs, and interactive, like those previously mentioned outdoor spaces for activities. Your audience’s experience is what determines the success of the event, so base your decision on their needs. Incorporating the most appropriate keynote speaker does in fact start with your budget. More importantly, it’s about the context and central theme of the event, and how well you know your audience. The selection of speakers to choose from is always extensive, but understanding your audience helps you anticipate how they will respond. So, how can you screen your options and narrow it down? Certain types of speakers, like inspirational or motivational ones, are a dime a dozen, according to Taylor. Most of the time, your decision stems from recommendations, the speaker’s reputation or history and your general knowledge of the industry. Yet, speaker bureaus are another useful way to evaluate your choices if you’re not sure where to start. Speaker bureaus host a variety of speakers from multiple categories and offer recommendations based on your event’s needs. Leverage your relationship with a speaker bureau, and you’ll incorporate the industry’s most talented speakers into your event. No matter who the final keynote speaker is, encourage them to interact with the participants to continue driving engagement. Even in the case where your speaker is someone from your team or a member of leadership, prep them in advance with helpful tips. Interactive Q&A formats, live streaming, social media and more build trust with your audience. Again, it’s all about making their experience meaningful and memorable. Corporate events usually pack a variety of experiences into a limited amount of time, but at the end of a productive day, there are always opportunities to unwind. Whether that means a cozy night filled with acoustic music or a full out, high-energy rock concert, the entertainment you incorporate all depends on the message of the experience you want to offer. Unlike speaker selection, there’s less of a margin of error to work with when it comes to entertainment. In Taylor’s event planning experience, you usually know what you’re going to get since an entertainer’s content is more accessible prior to the event than a speaker’s. And although this is a time meant for relaxing, be mindful that you’re still communicating a message to your audience, even indirectly. Understanding the demographics of your audience significantly simplifies your choices as well. For example, while ULTA Beauty and O’Reilly Auto Parts might have similar goals to improve their customer’s experience in-store, entertainment selections are vastly different at their events because of their audience’s preferences. In addition, they’ve leveraged the relationships with their partners or sponsors to bring in talent their people can connect with. When you plan your corporate event with purpose, your people connect to a meaningful experience with unlimited opportunities for engagement. Take into consideration the kind of experience you want to offer as you select the venue, speakers and entertainment. One last tip: Study every agreement, rider and contract thoroughly. This will clarify the necessary accommodations and avoid any future setbacks. Begin and end your corporate event planning process with your people in mind and you’re guaranteed to make an impact!